I’ve been thinking about this one for a long time. Basically, you take all the elements of a great cheese cake and put them on a pizza. It’s actually pretty simple. There are only three components to a great cherry cheesecake- the cherry compote, the cream cheese cake filling, and the graham crumb & butter crust. 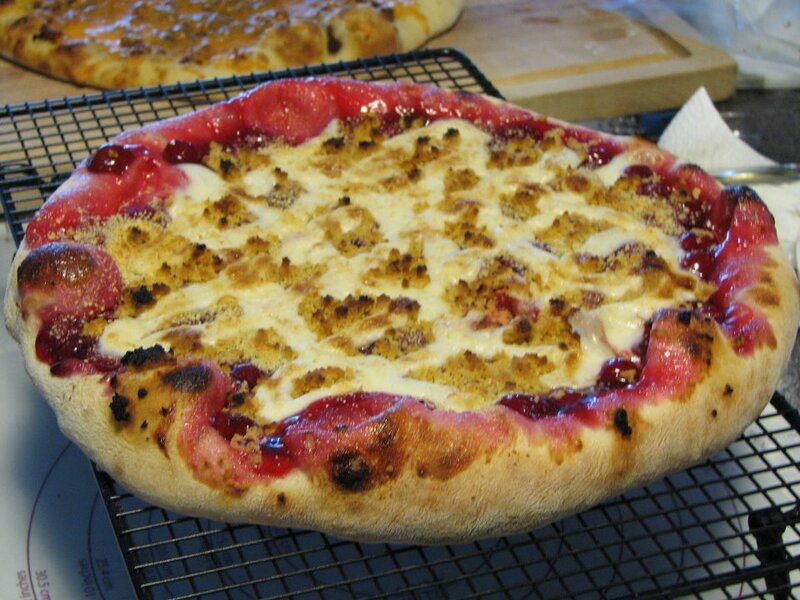 So, again we start with my standard pizza dough recipe (if you aren’t sure what that is, go back to my first pizza blog post and you’ll find it here) and I spread a can of cherry pie filling on top of it. I didn’t actually think I’d need the whole can, but… well… turns out I did! Then I took some melted butter, and added graham crumbs to it until it was a nice crumbly texture that would stick together slightly when pressed, but not wet anymore. I sprinkled that on top of the cherries. Lastly, I had some leftover vanilla cream cheese butter cream frosting that I piped on top. Google “Martha Stewart cream cheese buttercream frosting” and you’ll find the recipe easily enough. I also took an extra tablespoon of graham crumbs and sprinkled them on top as well. Pizza went on the BGE for about 5 mintues at 600F, and it was an ooey gooey delicious dessert when it came off. It was all we could do to let it cool on the wire rack before digging into it. And honestly, I ate the last leftover piece for breakfast this morning and it was just as good cold! Wow … that is certainly novel! I so want to eat this up right now. That looks amazing. Great job. Like the new background to your page as well. Thanks! I changed the background and header now that we have a lot more of our own pics to choose from. Looks a little less like a BGE commercial now and a bit more personalized. Those are Brian’s Cluck &Squeal chicken legs – probably our favorite thing that comes off the Egg!